As www.islandstats.com previously reported, the Bermuda Hockey Academy (known as Islanders 2 in the NEFHA league is playing a series of two matches in Bermuda next week on Friday, December 7th at 6pm and on Saturday December 8th at 10:45am. 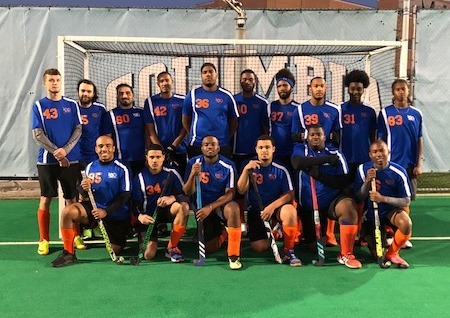 The first match on Friday, December 7th, is the Islanders Cup Match which is an annual rivalry match between the two Islander Hockey teams (Islanders 1 – the New York Players and Islanders 2 – the Bermuda players). The second match is a North East Field Hockey Association league between the Islanders teams. This will be the first time ever that a NEFHA league match will be held in Bermuda. “As part of our league season, we requested and it was agreed that we could host at least one home game during the season as we wanted to give an opportunity to the parents of our young players as well as our sponsors and supporters the ability to watch a match live so that they can see for themselves the growth in our players. The Academy hopes that these games will help to inspire the next generation of players, as well as the local hockey community to help to raise their game and challenge themselves in new and creative ways,” concluded Melo.